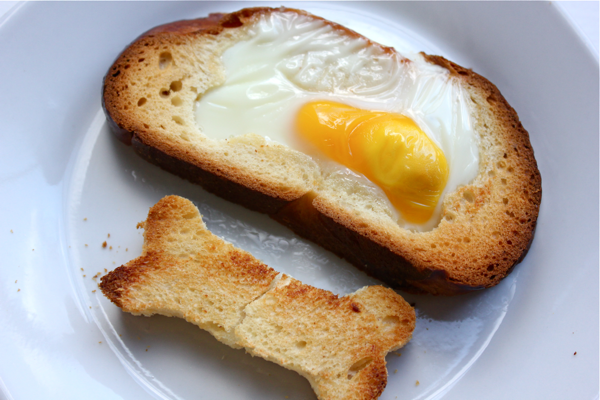 I love eggs in the basket- whole eggs cracked into a cut-out piece of toast and baked until it is golden. My mom always made them for me. 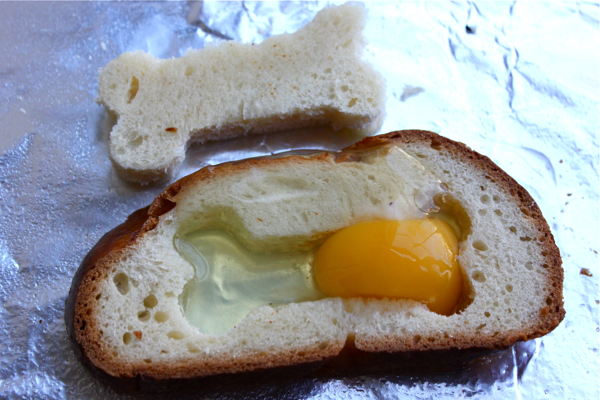 My favorite part is eating the crispy crouton cut-out that bakes alongside the egg. It’s so good. Around Valentine’s Day, I saw a lot of blogs featuring heart-shaped eggs in the basket. They were so cute. I couldn’t believe I had never thought of that before. 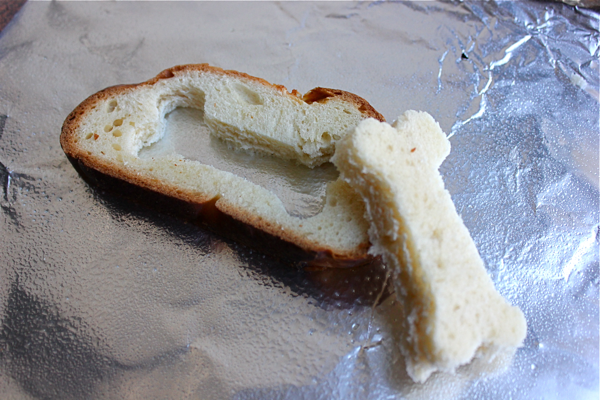 So I sliced a piece of homemade challah, and searched for a cookie cutter that would fit the slice. A dog bone was perfect. If you didn’t think I was nuts before, you certainly do now. To make your own, preheat your oven to 350ºF, and put your cut-out bread on a greased baking sheet. Crack an egg into the hole and bake it all for about 10 minutes until the egg whites are fully cooked. My egg was a little squished, but that didn’t stop it from being delicious! I love peeling the bread apart and using it to eat the egg. Yum. What a comforting little snack or breakfast- even if it did look like it was better suited for Stella pup. It just so happens to be my favorite breakfast dish. I love challah. Will be used as a cookie cutter.